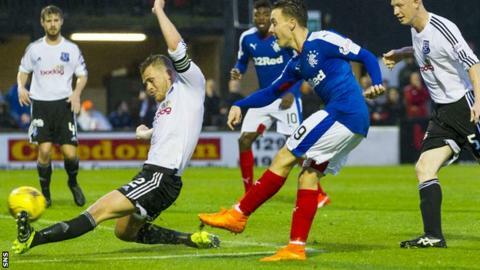 Rangers maintained their strong start to the season with a convincing display to knock Ayr United out of the Scottish Challenge Cup. Mark Warburton made five changes to his line-up, but the team's momentum remained unperturbed to overcome a determined Ayr. Nicky Clark and Barrie McKay scored with first-half strikes that established Rangers' superiority. Ayr impressed in patches but lacked the wherewithal to alarm the visitors. The home side set out to be fiercely resolute and Ross Docherty was penalised for a foul on Nathan Oduwa straight from kick-off. United ended with four players booked and hefty challenges were a feature of the game, with Rangers also collecting three yellow cards. Referee Stephen Finnie had to be alert throughout and judgement calls were inevitably challenged, not least when Oduwa was barged aside by Peter Murphy inside the penalty area during he second half. Oduwa, making his first start since joining the club on loan from Tottenham Hotspur, drifted in and out of prominence but on the ball he was often compelling. With his lithe, long limbs and elusive running style, there was an air of uncertainty whenever he was involved in the play, which often prompted booing from the Ayr fans. Early in the game he slipped and his backside bounced off the ball and after the interval he sliced a shot wildly askew. Yet his runs at defenders were always threatening and he contributed much to Rangers' attacking play when moving the ball swiftly and sharply. That kind of slick passing was central to the best of Rangers' work and created the opening goal. Tom Walsh slipped a clever first-time ball inside Ayr right-back Nicky Devlin for Jason Holt, whose cross was deftly converted by Clark. A similarly quick, incisive move delivered the second goal just before the break when Ayr midfielder Brian Gilmour allowed the ball to bounce over his head to Walsh. The Rangers attacker burst upfield before playing in McKay, who despite facing three defenders made space to slam a left-foot shot into the net. Ayr pressed for a response and, when Devlin lifted a long ball into the right-hand channel, Rangers goalkeeper Wes Foderingham rushed out and sliced his clearance, allowing Craig Moore to gather, but the angle was too tight as he steered the ball into the side-netting. The intensity of the play remained high after the interval and the impressive McKay drew a two-fisted save from Greg Fleming in the Ayr goal, while Clark pushed a Martyn Waghorn cross on to the post from close range. Yet Ayr held their nerve and Moore will feel he should have been more accurate after a sharp spin inside the area instead of lashing the ball over. In the end, though, it was a satisfying workout for Rangers, with Dominic Ball, also on loan from Spurs, playing the full 90 minutes.